Hi everyone. Here's some additional information you may be interested in. Valentin Skroch (1781 - 1826) and Maria Susa (1786 - 1860), according to Valentin's death record, had five surviving children at the time of his death. Based on previous research, Jacob (born 1804) was determined to be one of the children. The identity of the other four have been a source of some mystery. 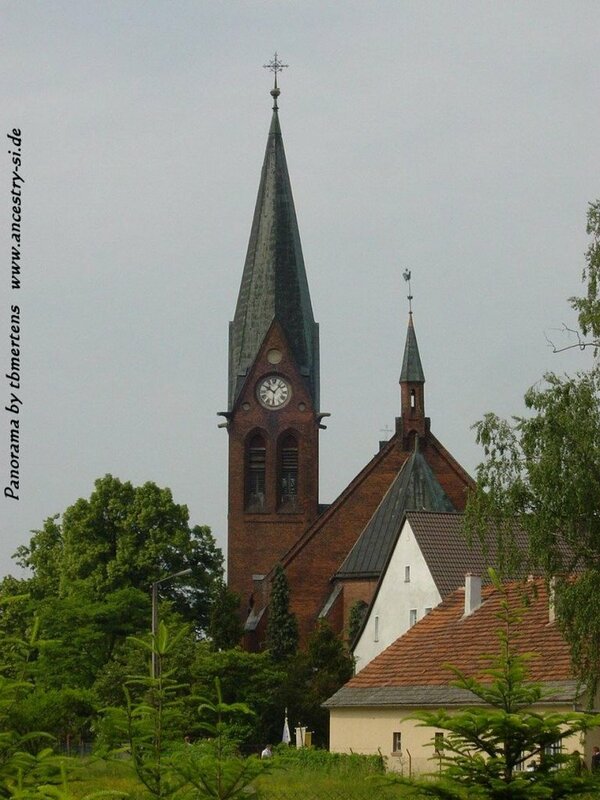 During my recent research of baptismal records, I found two of the children: Anna (born 1806) and Andreas (born 1810). I believe I sent you all copies of those records. 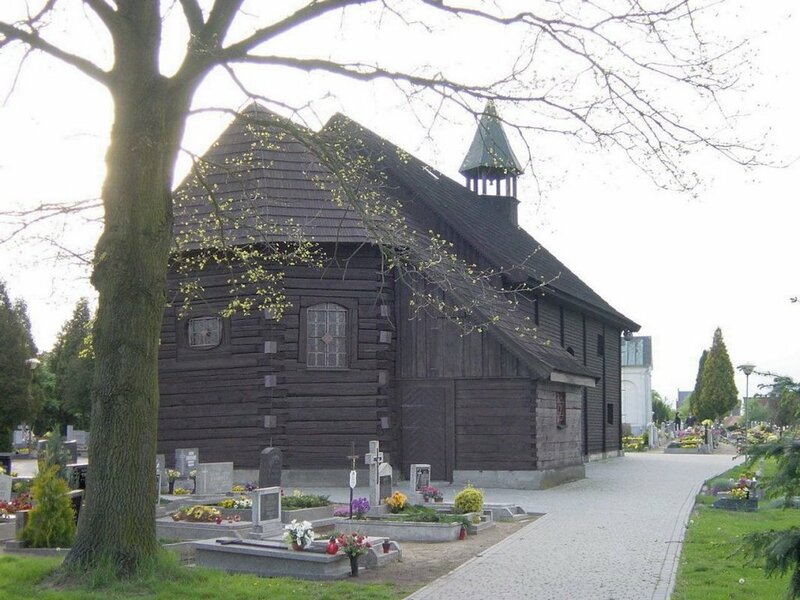 Unfortunately, LDS microfilm baptismal records for Poppelau (Popielow) are not available after 1815 and I think perhaps the original records may be lost or destroyed. This made it difficult to find the remaining two children. 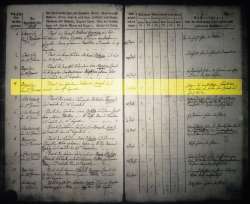 Fortunately, marriage and death records are still available after this period, and based on those records, there is indirect evidence of who the remaining two children are. I'm fairly confident the two youngest are: Catharina (born about 1822) and Theresia (born about 1825). 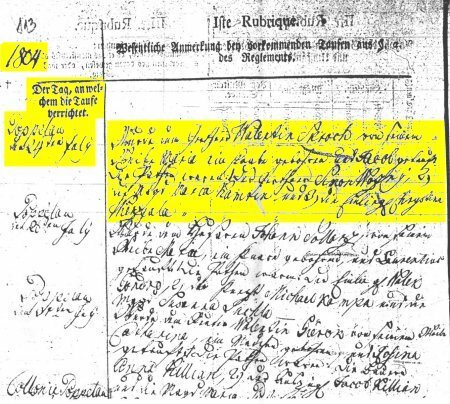 This is based on their marriage records which show Catharina (daughter of Valentin Skroch) marrying Blasek Moczko on 31 Jul 1849 in Poppelau and Theresia (daughter of Valentin Skroch) marrying Joseph Gorlich (or Gerlich) on 18 Jan 1858 in Poppelau. 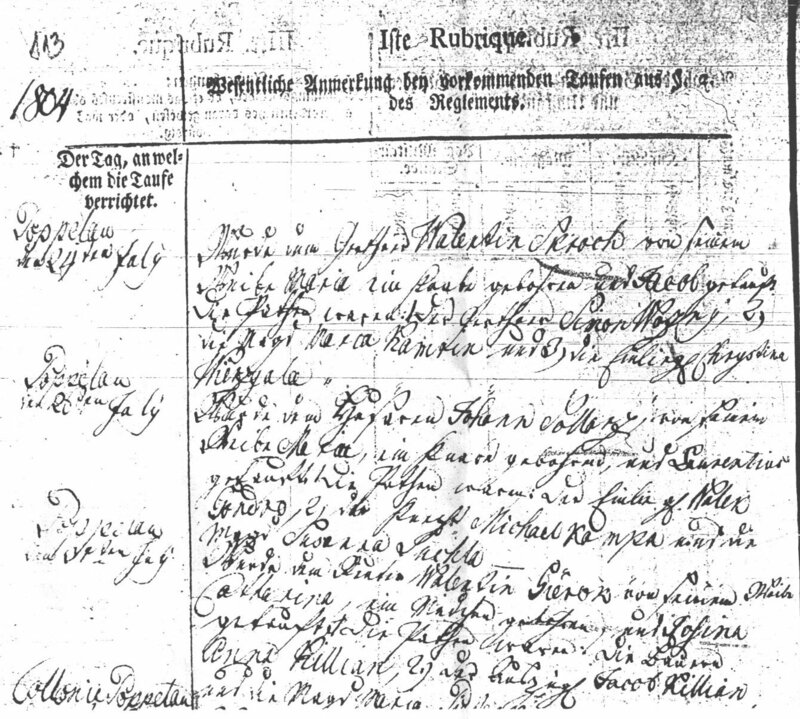 There is further evidence for Theresia in that Maria (Susa) Skroch's death record dated 02 Dec 1860 lists three surviving children: Jacob, Anna, and Theresia. I did find that Andreas died in 1828 at the age of 18 and I believe Catharina must have died before 1860. I don't want to get ahead of myself, but I was excited to find an entry in the LDS microfilm #2099221 regarding Valentin Skroch. 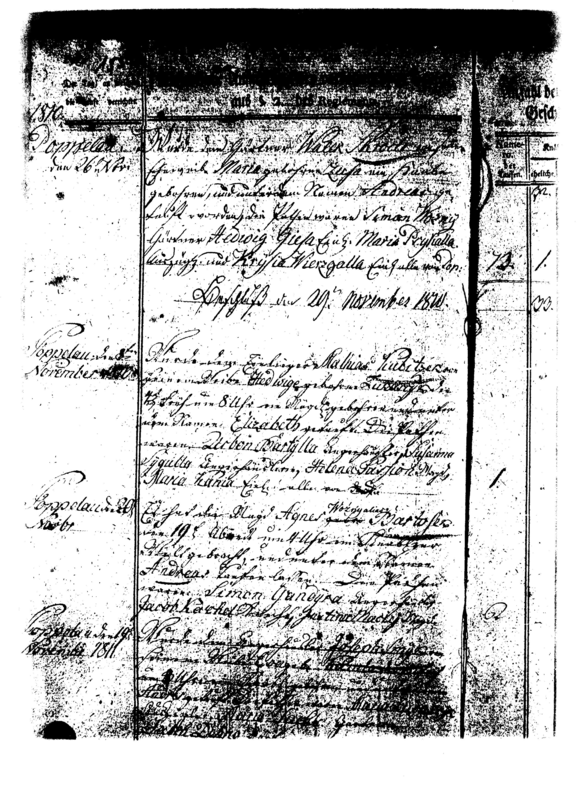 Attached is an image showing the baptism record of Valentin Skroch dated January 28, 1781. His father is Michael Skroch and mother is Hedwig. I was excited because his birth year matches what is posted on skroch.org, and therefore would appear to be a strong candidate to be our direct line. I would be interested in hearing your thoughts. Perhaps Thomas could provide a translation of the record for us? I've only been able to go partly through the film, but Valentin appears to be the second child. 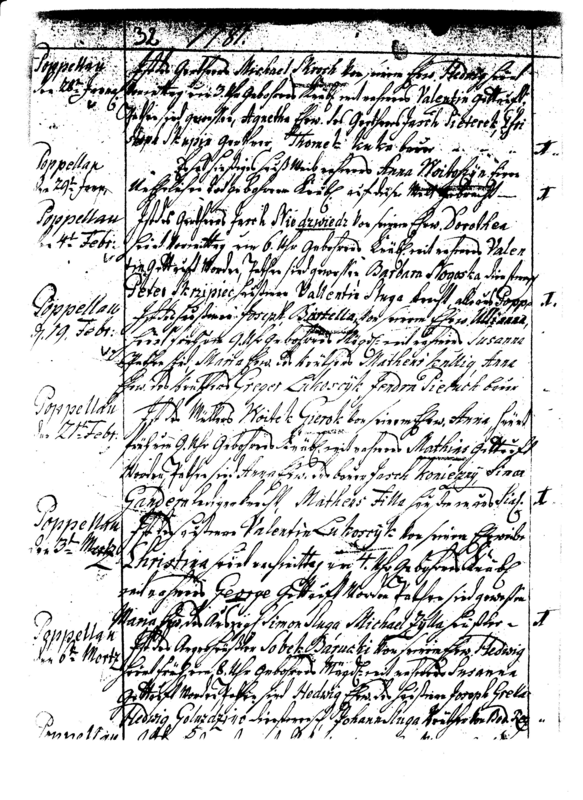 There is an earlier entry for Michael and Hedwig Skroch who had a daughter Dorothea baptised on February 6, 1779. I will continue the research and see if they had more children. It's sort of poetic, don't you think Michael, that your namesake may be one of our early ancestors? here a small translation of the old german script. Ist des Gärthner Michael Skroch von seinem Ehew. Hedwig früh Vormittag um 3 Uhr geborens Knäbl. (=Knäblein) mit Namen Valentin getauft. Is gardener Michael Skroch from his Wife Hedwig early morning at 3 o'clock a boy born and baptized with name Valentin. By the way... 3 days ago I was on vacation and visit the church were the baptism was done. The church is now placed on the cemetery, but was placed earlier where the 'newer' church was build ~100 years ago..
Click on image for larger version. 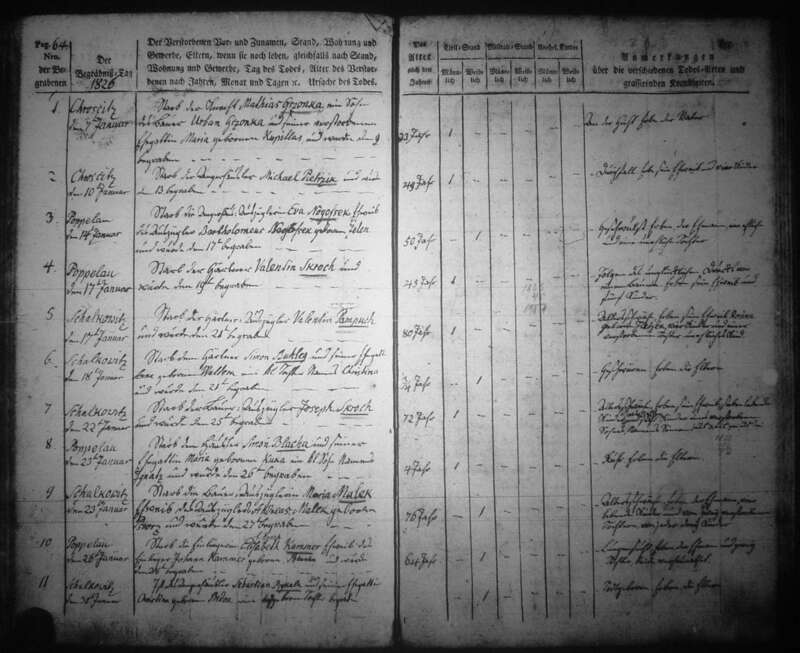 Birth record of Jacob Skroch identified by Kevin Skroch (son of Emil George Jr. ) who indicates "...record of Valentin and Maria Skroch - 1804 - Popielow. Film # 0937161. Stare Siolkowice years 1751-1812." Translation from Thomas Bauch-Mertens and his grandmother, both in Germany, indicates that the document is wrtten in "old German," called "Suetterlin." The day, on which the baptism was done. Simon Wozny, Maria Valentin,Christina Wiezyala. Walentin was the son of Michael Skroch. "Starb der Gärtner Valentin Skroch und wurde den 19ten begraben"
"Died the gardener Valentin Skroch and bury on 19th"
"in result of the unlucky ?Dru..? from a ?farmer?. Inherit his wife and 5 children." 27 Mar 2010 : Possible lead ... "Im John Bjorge, one of my ancestors was a Maria Skroch who was said to be the daughter of Valentin Skroch. Could you help me with this. Maria was born around 1813. Maria married Jacob Kubis around 1834. I hope i have the right Valentin Skroch." Some exciting news. I think this will help clear up some of the puzzle surrounding Valentin. I think I may have found two more of Valentin's children: Anna and Andreas. We'll have to ask Thomas for translations of the attached to be sure, but one attachment is the baptism of Anna Skroch on 26 Dec 1806. The second attachment is a close-up of the same record. Father is Valentin Skroch and mother looks to me like Maria Susa. 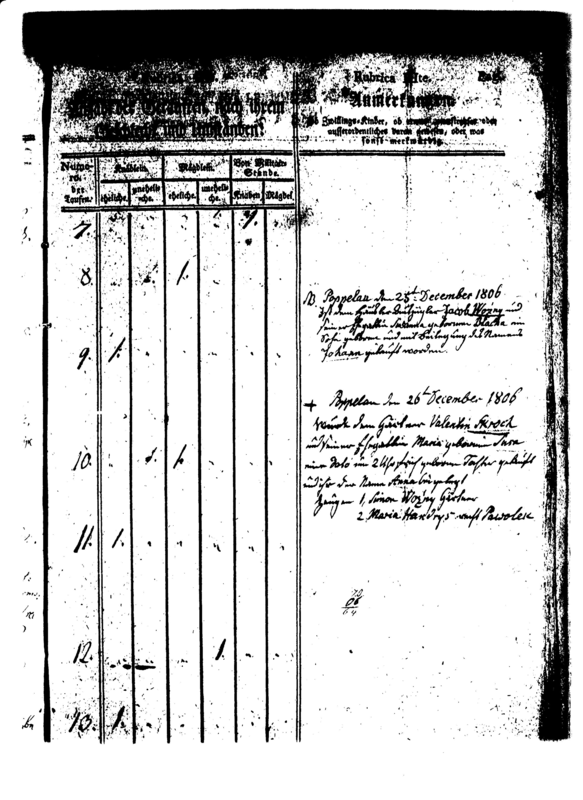 The third attachment is the baptism record of Andreas Skroch on 26 Nov 1810. Father is Walek Skroch and mother is Maria Zusa. However, I'm pretty sure this is the same Valentin and Maria. As Thomas explained, Walek is another variation of Valentin. Thomas, can you help us with the translation please? I feel very fortunate to have you as our cousin. Both records are from LDS film#09737161. Unfortunately, this roll only goes to June, 1812 so I will have to order a different roll to look for the rest of Valentin and Maria's children. It will take 2-3 weeks for it to arrive.